It's Mother's Day, different than any other for us, and thousands of other families scattered across Alberta in the homes of friends or family, in evacuation centres and in myriad accommodations from travel trailers to hotel rooms. I struggle to remember what day it is, let alone being prepared to honour the mothers in my life. When the crisis first erupted on May 3, 2016, the first and only instinct for me was to text Heather and let her know that I was on my way. She didn't answer. I texted again. Still no answer. I found out later that she had a client on the table. It wasn't until the client got a flurry of texts that Heather realized what was happening. She leapt into action and did what I could not do. She made lightening fast decisions to get Dylan packing and taking pictures of each room in the house while she went to the school to pick up Ben. Even in the middle of gridlock traffic she was able to pick him up, choose the best route, get home, complete the emergency packing and get our family on the road to safety. I don't exactly know the timing of everything, but looking at the texts from that day helps. Some time after this she called and told me that Dylan was packing and that she was going to pick up Ben. We exchanged words of love and said goodbye. It felt unnerving being apart from this moment on. HEATHER to ME: Grid lock downtown. Take your first exit to Prairie Loop. My mind was on getting home. At this point, I was picturing easily getting down the hill and turning off Highway 63 on to Prairie Loop Boulevard. ME to HEATHER: Super scary. Love you. HEATHER to ME: Love you too. I have Ben and water from Walmart. Heather has the presence of mind to grab bottled water and a few other things. In her mind, it was still potentially going to die down. She bought some sausages in case we needed something for dinner. ME to HEATHER: Have never been so scared. Tempted to park the car and run home. HEATHER to ME: Where are you? ME to HEATHER: Visitor's Bureau. The back and forth of texts stopped shortly after I began the exodus south. We must have switched to social media at this point. The cellular system likely got overloaded as 80,000 people were communicating with each other and with family and friends all over the world. 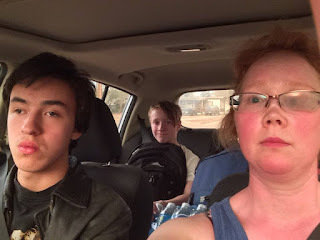 This amazing mother got our two sons to safety, shouldering the most intense situation we have ever faced, with me on the other side of the fire. She remained calm and strong, eventually (many hours later) getting to Fort McKay to the home of two other mothers in our lives: Patsy (Dylan's Grandma) and Nadia (Dylan's mom). She was frightened, stressed, concerned and hurting, but she was strong and kept our sons safe. She also did a remarkable job getting the exact collection of necessities under remarkable pressure and time constraints. This event brought out the best in most of the people who are going through it and those who are reacting to it. It highlighted in our own family, the resiliency of Heather and the boys, and the incredible bond that we share. Perhaps our Mother's Day moment was the hug we had the moment they got off the plane. To all the mother's that guided their children through the flames and smoke to safety: you are heroes, all. Happy Mother's Day.